Pharmathen is a research-centered pharmaceutical company that focuses on developing innovative generic products. They provide a range of integrated services including finished products, know-how and technological and regulatory support to its partners worldwide. Founded in 1969, Pharmathen is one of the largest independent generic development companies in Europe. With a pipeline of approximately 10 generic molecules a year and export activities in over 80 countries, the company has reached export sales dynamics that amount to 70% of the group’s total annual sales. Like many Pharmaceutical companies, Pharmathen is no stranger to tight deadlines and staying current with new regulations. Even with a seasoned team of professional proofreaders, there never seemed to be enough hours in a day for this ever-growing company. Fortunately, Pharmathen recognized that they have some indispensable talent, and wanted to ensure their happiness by reducing stress and providing an environment where they can grow as professionals. When you have an expert team with decades of experience in the pharmaceutical space, it is inefficient for them to spend hours reviewing large documents. Reviewing materials for punctuation as well as stylistic formatting details is extremely time consuming and error prone. At Pharmathen, this tedious part of the proofreading process was identified as the bottleneck, so Management was mandated to find a tool that would assist their team. By alleviating the need for manual proofreading, Pharmathen was hoping to increase employee satisfaction, and consequently increase production. In the end, Pharmathen choose the Text Verification Tool® (TVT) since it fit all of their criteria and more. A TVT customer since October 2017, the Pharmathen users are pleased and continue to be surprised by how straightforward and intuitive the TVT interface is to navigate. “TVT is so simple to work with, even without any previous experience or training.” Said Stavroula Asimakopoulou, Product Information Specialist at Pharmathen. A regular user of TVT, Eleni Christodoulopoulou, Regulatory Affairs Associate at Pharmathen, was relieved to learn a new software without having to read a big manual. “As a proofreader, I already have so much reading to do – the last thing I want to do is add more reading to my list!” added Christodoulopoulou. 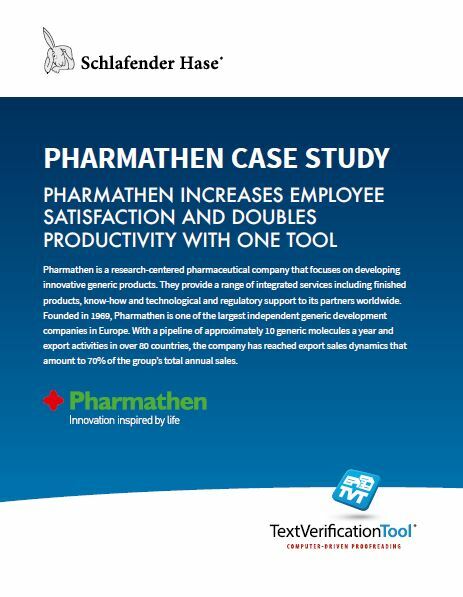 Just months after implementing TVT at Pharmathen, the team can say with confidence that the tool is making a difference in their daily work lives. “TVT has cut the time it takes me to proofread by over 50%” said Stavroula Asimakopoulou “It used to take me at least 3 days to review my projects, but now I can do the same amount of work in 1 day.” Adds Asimakopoulou. Being a daily TVT user, this has resulted in weeks of gained time and much less stress.